At left, Morgan is pictured as Col. Sherman T. Potter, a role he played on "M*A*S*H" from 1975-1983. That memorable portrayal earned him an Emmy in 1980. 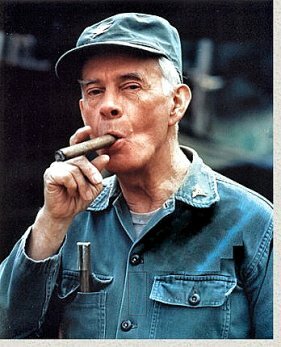 One of the most versatile and beloved of actors on television is Harry Morgan whose career on TV took birth in the "Golden Age" and has continued strong through the years, into the 21st Century. He's had prominent roles in the casts of 12 television series — a feat unmatched by any other actor — and guest roles in innumerable other series. His career included parts in more than 100 motion pictures (being credited in earlier films as "Henry Morgan," a name he ceased using to avoid confusion with the "I've Got a Secret" panelist who also adopted that moniker). And he was in radio. Listen to a single sentence spoken by the announcer in a recording of "Mystery in the Air" and you'll know at once that the voice was that of Harry Morgan. Morgan was born Harry Bratsburg, in Detroit, on April 10, 1915. His father was Norwegian. Both of my paternal grandparents were immigrants: my grandfather from Trondheim, Norway, and my grandmother (Anna Olsen) from a small town in Sweden. They met after arrival here, where my grandfather and his two brothers worked on the Erie Canal. One of the brothers, Tovas, returned to Trondheim after a dozen years, and I was thrilled to visit him there in 1966. The other, Werner, dropped out of sight and was never heard from just a year or so after arriving. My grandfather was considered to be an expert mechanic, and worked in that field in Detroit, where my dad was born in 1915. The family moved to Muskegon, Michigan in 1920, which at the time was a town where Norwegian was spoken on the streets and a good many of the country's engine blocks were manufactured. He was selling (or not selling, as he clarifies) office equipment with Shaw Walker in Washington, D.C. in the mid-1930's, and tried out for some summer stock parts with local theater groups. This led to roles and try-outs with more important companies, and then to summer stock companies outside New York City. There he appeared in a play with Frances Farmer, and she helped him get an interview with The Group Theater, comprised of a great many of the finest dramatic talents ever in U.S. history: Clifford Odets, Howard Clurman, Elia Kazan, Lee J. Cobb, John Garfield, Karl Malden. My dad was accepted into the Group, and appeared in a very successful Odets play called "Golden Boy," in which he played a boxer, Pepper White. (We used to have a nasty family dog by that name.) It played Broadway for a year and then another six months in London, where the cast spent some time with Paul Robeson and met Winston Churchill. Frances Farmer was from Seattle, where she had grown up with my mother, and my parents met while working together in a William Saroyan play called "My Heart's in the Highlands." They came out here sort of by way of a honeymoon in 1940, and my dad found work in small theater and in radio. He had a sort of breakthrough in another Saroyan play called "Hello, Out There!" 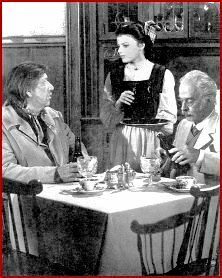 (a very charming one-act work with just two characters, the other part played by Jennifer Jones), which was staged in a playhouse in Santa Barbara. It was later produced as a film by Huntington Hartford, who cast his future wife in the Jones part, and it was to be the last work directed by James Whale (who had done the two Frankenstein classics) in 1950. The film was a paring of "Hello Out There!" with another one-act work, but it was never released and there is no known surviving print, or so they tell me at the UCLA Theater Arts archive. "Hello Out There" led to a contract with Fox Studios and a few years of security, with my father appearing as Henry Morgan in a few dozen films, often as comedic character or a heavy — not much in between. One memorable role was in "The Big Clock," in which he plays a very menacing bodyguard/henchman to Charles Laughton. His lines were perfunctory and so he suggested that they just have the character be a mute — a touch that works very well. His performance sure scared me when I saw it as a child! Through the years, Morgan appeared opposite many hundreds, probably thousands, of actors, including, of course, fellow Norwegian Americans. Below are some of the pairings. •Morgan and Carole Landis were both in "Orchestra Wives" (1942). She was listed in the credits, toward the bottom; he was uncredited. Four years later, he again appeared in a flick with Landis, "It Shouldn't Happen to a Dog." She was the star; he was listed fourth in the credits. •He appeared as a supporting player in "Holiday Affair" (1949) and "Not as a Stranger" (1955), both starring Robert Mitchum. •Morgan had the role of a sergeant in "What Price Glory" (1952), set in World War I, with James Cagney, as the captain, heading the cast. •In a 1971 made-for-TV movie, Morgan had the role of Inspector Richard Queen in "Ellery Queen: Don't Look Behind You," and E.G. Marshall had the No. 3 role. It was a pilot for a series; it failed, understandably, owing to the botched casting of Britisher Peter Lawford as Ellery Queen. "He has enjoyed a fifty-year career in films and television by being an everyman, equally effective playing characters who are wisecracking (the soda jerk in 1942's Orchestra Wives), brutal (the bodyguard thug in 1948's The Big Clock), obtuse (the next door neighbor in 1948's All My Sons) or authoritative (the Scopes Monkey Trial judge in 1960's Inherit the Wind)." Maltin went on to observe that Morgan " is best known for his roles in an astonishing array of television series, both dramatic and comedic." "December Bride" (1954-59). Spring Byington was the star. Morgan was the next-door neighbor, Pete Porter, who constantly griped about his wife, Gladys (never seen), and his mother-in-law. 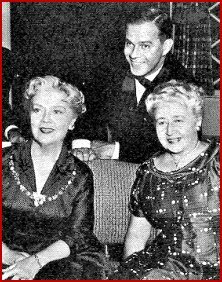 The charismatic Morgan is seen with Spring Byington (left) and Verna Felton in a publicity shot for "December Bride." 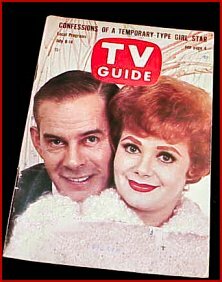 Morgan was on the cover of TV with his "Pete and Gladys" co-star, Cara Williams. The series was a "December Bride" spinoff. "Pete and Gladys" (1960-62). Morgan reprised his role as Pete Porter, and Gladys — who in this series was seen — was played by Cara Williams. It was an endearing comedy. "The Richard Boone Show" (1963-64). This perhaps marked the high point in Morgan's television career, and one of television's finest moments. The program featured 1.) a standing cast, combined with 2.) an anthology format. Neither element, in itself, was at all distinctive — but in combination, there was uniqueness. Each week, each stock player assayed a different role. Each player showed off his or her versatility, a quality which surely marks Morgan. "Kentucky Jones" (1964-65). Dennis Weaver portrayed veterinarian Kenneth "Kentucky" Jones and Morgan was Seldom Jackson, a handyman at the doctor's ranch. 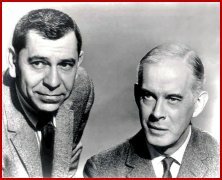 Morgan, as Officer Bill Gannon, is pictured with Jack Webb, playing Sgt. Joe Friday, in a reprisal of the 1950s series, Dragnet. "Dragnet" (1967-70). Few reprisals succeed. This one did, and the casting of Morgan as Officer Bill Gannon might be a significant reason for that. The light-hearted interplay between Morgan, as Gannon, and Jack Webb, as Sgt. Joe Friday, was priceless. Gannon was constantly advising and lecturing Friday. "I'm telling you, Joe..." he would begin, and a nonplused Friday would listen, then utter a noncommittal response such as "Is that so?" In the final season, Gannon made frequent references to boning up for the sergeant's exam and, in the end, got his promotion; Friday, who spoken nary a word about studying for the lieutenant's exam, was promoted at the same time. Morgan appeared in the 1987 "Dragnet" movie as Captain Bill Gannon, and provided the voice for Gannon in a 1995 episode of "The Simpsons." "The D.A." (1971-72). This was a short-lived series produced by Webb. Robert Conrad was the D.A. and Morgan was Chief Deputy D.A. H.M. "Staff" Stafford. "Hec Ramsey" (1972-74). Richard Boone played Ramsey, a turn-of-the-century gunslinger-turned-policeman. Morgan was Doc Amos Coogan. This offering of Jack Webb's production company was not a weekly series; it was one of the alternating features on "NBC Sunday Mystery Movie" (along with "Columbo", "McCloud", and "McMillan and Wife"). Morgan is seen as Doc Amos Coogan in "Hec Ramsey." Richard Boone, at left, played the title role. The waitress is Susan Keener. Morgan is seen as Col. Sherman T. Potter, commander of the 4077th "MASH" (Mobile Army Surgical Hospital). "M*A*S*H" (1975-83). It was for his portrayal of Col. Sherman T. Potter that Morgan won an Emmy in 1980. He was a crusty, loveable, dogmatic military man and doctor, with an affinity for horses. The show was set in the Korean War. 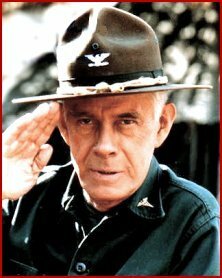 Morgan had earlier played a guest-starring role in "M*A*S*H" as General Bartford Hamilton Steele, a deranged martinet. According to lore, the excellence of his performance prompted producers to give him the role of the camp's commander when the predecessor colonel, played by McLean Stevenson, left the show for what turned out to be browner pastures. "AfterMASH" (1984-85). This was a spin-off from "M*A*S*H", reuniting Morgan and two other alumni of the MASH unit (Jamie Farr as Max Klinger and William Christopher as Father Francis Mulcahy). They were joined in a hospital in the United States after the war. The concept was sound, the cast was proven. However, the scripts were mundane, and the show just didn't click. "Blacke's Magic" (1986). Why this series did not win favor with the public is puzzling. It was excellent in all respects. It starred Hal Linden, formerly of "Barney Miller", as Alexander Blacke, a magician-turned-sleuth, and Morgan as Leonard Blacke, his father, an ex-conman who was a master of disguises. It was conceived and guided by the trio behind "Murder, She Wrote": Peter S. Fischer (executive producer/writer of that series and creative consultant/writer of "Columbo"), and the team of Richard Levinson and William Link (writers, who created "Columbo", "Mannix", "The Bold Ones", and "Ellery Queen"). "You Can't Take It with You" (1987-88). Based on the play by Kaufman and Hart, the series was set at the turn of the century in Staten Island. Morgan starred as Martin Vanderhof, patriarch of the clan. This was Morgan's only syndicated series. Morgan also had recurring roles in series, with a penchant for playing the character three times. In 1961, he appeared in three episodes of "Dr. Kildare" as Francis X Healy. "Wild Wild West" was reprised in three specials aired between 1979 and 1980; Morgan was in each of them, as Robert T. "Skinny" Malone. He was in three TV movies (teamed with Walter Matthau) as Judge Stoddard Bell: "The Incident" (1990); "Incident in a Small Town" (1994); "Against Her Will: An Incident in Baltimore" (1992). And he was the special guest star in three episodes of "3rd Rock From the Sun" during its initial season, 1997-97, playing Professor Suter. Morgan's fictional political career included not only serving in the presidency, but also as Secretary of State Deems Sarajevoin in "John Goldfarb, Please Come Home" (1965), Mayor Olly Perkins in "Support Your Local Sheriff!" (1969) Mayor Taylor Barton in "Support Your Local Gunfighter" (1971), and as a United States senator in "Patton" (1970). The actor's stint as a colonel in "M*A*S*H" was not his only make-believe tour of duty in the military. Through the years, he's held just about every rank there is. He's been a marine named "Mouthy" in "To the Shores of Tripoli" (1942), Private Shevlin in "Eve of St. Mark" (1944), Captain Purvis in "A Bell for Adano" (1945), a soldier in "Dark City" (1950), Sergeant Moran in "What Price Glory" (1952), Major Halle in "Prisoner of War" (1954), Sergeant Bible in "Strategic Air Command" (1955), Sergeant Gregovich in "Teahouse of the August Moon" (1956), Sergeant Dusak in "Under Fire" (1957), Sergeant Michaelson in "The Mountain Road" (1960), General Ulysses S. Grant in TV's "How the West Was Won" (1962), Major Pott in "What Did You Do in the War, Daddy?" (1966), General Stilton in "The Cat from Outer Space" (1978), and Major Gaskill in "The Apple Dumpling Gang Rides Again." In addition to playing Officer Gannon and Inspector Queen, Morgan had numerous roles as a law enforcement officer, both in the wild west and in contemporary times. He played Lieutenant Richard Webb in a 1949 murder mystery, "Strange Bargain" — and assumed that role again in 1987 in an innovative episode of "Murder, She Wrote" in which scenes from the black and white movie were used as flashbacks. He's been a police lieutenant in Holiday Affair (1949), Sheriff Slade in "The Flim-Flam Man" (1967), Chief of Police Sylvester in "Viva Max! ", Sheriff Pippin in "Scandalous John" (1971), Sheriff Jenkins in the made-for-TV movie "Sidekicks" (1974), Sheriff McCoy in "The Apple Dumpling Gang" (1975), and Marshal Thibido in "The Shootist" (1976). He often played hoods in his early motion picture career; he's also donned a collar as Father Reed in "When I Grow Up" and as Father Kolodny in the TV movie "Rivkin: Bounty Hunter" (1981), and was the angel in Disney's "Charley and the Angel" (1973). Morgan appeared in classics like "The Ox-Bow Incident" (1943) and "High Noon" (1952), and had parts in movies best forgotten. He directed episodes of "M*A*S*H," "Hec Ramsey," and "The D.A.," as well as a series in which he did not appear as an actor, Jack Webb's "Adam 12." His latest appearance on television was in the "M*A*S*H: 30th Anniversary Reunion" in 2002. There was an entire year in there early on when my dad didn't get a single day's work, and he had four young mouths to feed. I've always had the impression from the way others speak of him that his background on the stage, and particularly with the Group Theater, afforded him a stature that others did not have, and helped him land parts in films by John Ford, Stanley Kramer, Henry Hathaway and Fred Zinneman; and that then the fact that he had worked with the industry's best directors meant a lot to a newer generation that knew little if anything about The Group Theater. Beyond all that, he never failed to deliver when given the chance, and I have always heard that he was just a pleasure to work with — very professional, with a wonderful sense of humor. Morgan and his first wife, Eileen Detchon, who died in 1985, had four sons. One, Daniel, succumbed in 1982. The surviving sons, in addition to Charles Morgan, are Paul Morgan, also an attorney, and Christopher Morgan, a producer of television feature motion pictures, most of them, in recent years, for the Disney Channel. In 1998, Harry Morgan married a granddaughter of Francis X. Bushman, Barbara Bushman Quine. His career has been long, productive, and successful. Morgan's voice and his face are instantly recognized. Charley Morgan and his brothers indeed can be proud of their dad. Read the text of Charley Morgan's speech, "Norwegians in Hollywood."